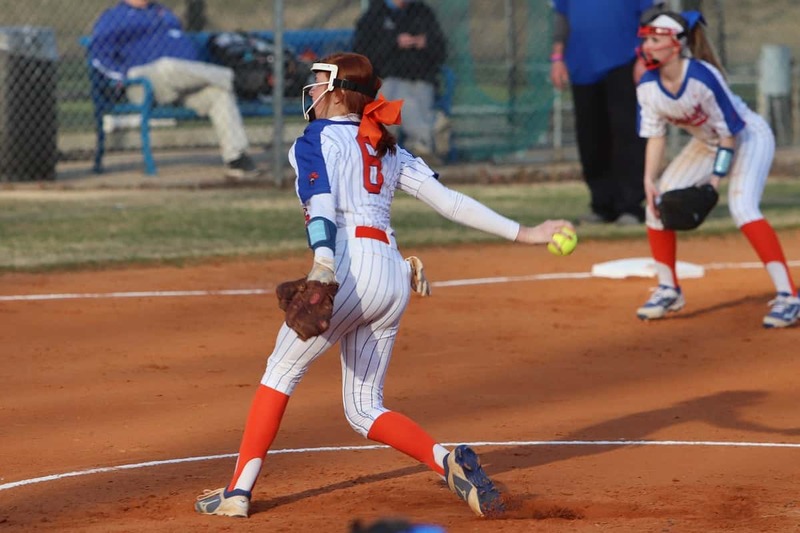 Gabbi Lovett, pitching in the Lady Marshals season opener against Graves County, led them to a 3-1 win over Daviess County in six innings on the mound, allowing four hits and only one run in Friday’s McCracken County Early Bird Tournament game. The Lady Marshals made it a three game sweep in their appearance in the McCracken County Early Bird Tournament with a 3-1 win over Daviess County, 7-0 win over Goreville, Ill. and 12-1 win over Pinckneyville, Ill. to improve to 4-0 in the early season going. 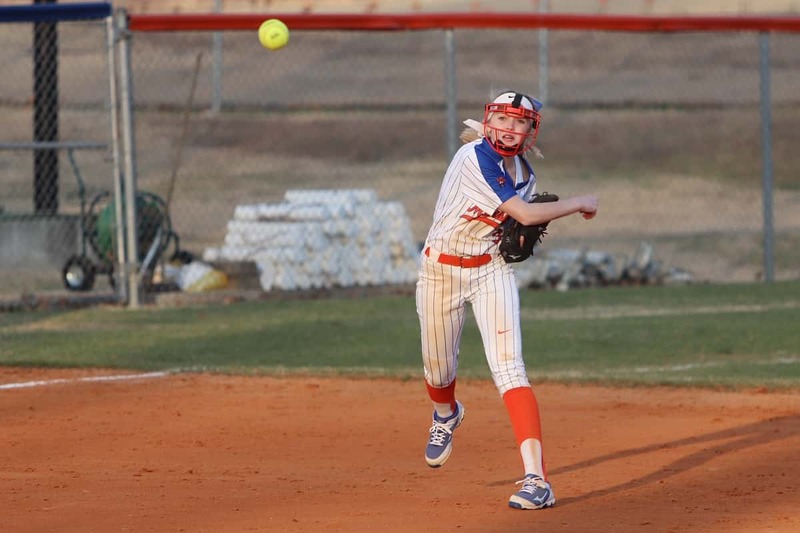 Friday against Daviess County after a scoreless first three innings, with Cayson Conner and Riley Piercefield reaching base on errors, Layne Pea’s ground ball gave the Lady Marshals a 1-0 lead. That was followed by Sarenna Tomassi’s ground ball that brought in Charley Pursley and Gracey Murt’s single brought in Pea to lead 3-0. Daviess County avoided the shut out, scoring a run in the sixth inning on a Hannah Clark sacrifice fly. Gabbi Lovett got the win on the mound in six innings of work, allowing four hits and zero runs. Murt’s two singles and an RBI led the hitters for Marshall County along with two singles from Pea. Presley Jezik, firing the ball over to first base against Graves County. Jezik was six for nine in plate appearance in McCracken County’s Early Bird Tournament, with a double and RBI. In their first of two games Saturday, the Lady Marshals shut out Goreville, Ill. 7-0 on nine hits. It was a scoreless first five innings for both teams before the Lady Marshals put two runs on the board in the top of the sixth on an error and single by Murt. They scored five runs in the top of the seventh on an error, singles from McKenzie Elkins and Presley Jezik and 2-run single by Tomassi. Lovett and Murt shared pitching duties on the mound to get the shut out. Pea led at the plate with three singles and an RBI and Jezik had two singles with an RBI. In their final game of the McCracken County Early Bird Tournament, the Lady Marshals had a great night at the plate with 18 hits in their 12-1 win over Pinckneyville, Ill. They opened with a run in the first inning off a single by Murt then put up three runs in the second on two outs coming on a 2-run single by Elkins and double from Jezik. The Lady Marshals added four more runs in the fourth on singles by Murt and Tomassi and a couple of Pinckneyville errors then sealed the win with another four run inning in the fifth, scoring on a sacrifice by Elkins, 2-run single by Murt and single by Addie Young. The win on the mound was recorded by Murt who worked four innings, allowing four hits and one run. Murt was also big at the plate for the Lady Marshals with three singles and four RBI’s. Jezik hit a single and two doubles and batted in a run, Young was four for four with a double and two RBI’s, Cayson Conner was perfect going three for three at the plate and Elkins hit a single and had three RBIs.